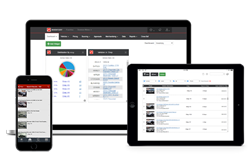 Dominion Dealer Solutions has introduced Dominion Recon, a software that tracks and manages the used car reconditioning process. Dominion Dealer Solutions, industry leader in automotive inventory management, responsive websites and equity mining, has launched Dominion Recon, a process-based, results-driven software solution that effectively tracks and manages the used car reconditioning process for automotive dealers. Dominion Recon is available to automotive dealers as part of Dominion’s Inventory Manager. Dominion Recon provides transparency and alerts to all dealership users in order to identify bottlenecks and create an efficient reconditioning process. Dealers using Dominion Recon see a reduction in time to market and greater accountability and tracking in getting used vehicles ready for sale. Through the inclusion of Dominion Recon, dealers can alert and deploy necessary resources, and hold dealership departments and service providers accountable for any time-to-market delays. Participating dealers can now streamline the entire reconditioning process with mobile access to Dominion Recon. Configured to each individual dealership’s process, this reduces the number of days a vehicle spends in reconditioning, thus driving additional inventory turns and ROI for the dealership. With the results-driven software, each department is alerted as the vehicle moves to the next stage of the reconditioning process. Dominion Recon contains executive, manager and operational alerts, automated reporting and dashboards, and dealer-defined workflows.